Play Viking Wilds Slot Online with 500 Free Spins! Viking Wilds is a 5 reels, 3125 paylines online slot game by Iron Dog Studio. 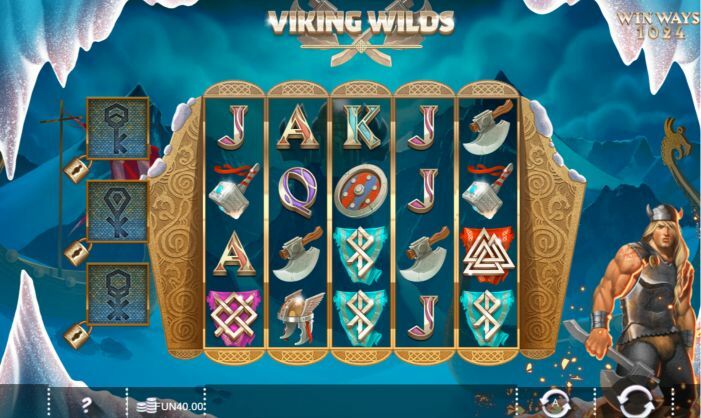 Viking Wilds has Wild, Sticky Wild, Multiplier, Free Spin, Collapsing Symbols and Expanding Symbols features and an RTP of 96.06%. The best place to play Viking Wilds is here at Rose Slots, which is also home to over 500 other leading UK online slots including Fluffy Favourites, Starburst, Rainbow Riches and Great Rhino. When the popular HBO television series ‘Game of Thrones' first became popular, we found ourselves inundated with online slot games set in a medieval world, or based around conquest. The show is still popular, but there's another battle-themed television production hot on its heels in terms of popularity, and that's ‘Vikings.' Because of that, Viking and Norse themed online slots are suddenly the order of the day for slot developers! We've seen plenty of them in the past twelve months, and we even have the official slot of the television show here at Rose Slots. With so many recent releases, how can a developer make their creation stand out from the pack? Iron Dog have worked out how to do it - you blend incredible visuals, authentic sound effects, and original gameplay to create a slot that doesn't look anything like its rivals. Viking Wilds is a gorgeous online slot game, with an atmospheric background that changes from spin to spin. A series of different Viking warriors may come and perch by the side of your reels from time to time as well, although they never go so far as getting involved in your game. The reels are 5x4 to begin with, and the number of ways to win is 1024 to begin with. We say ‘to begin with' because that can vary dramatically throughout the game, depending on how well the reels are spinning for you. Success in Viking Wilds is all about - you guessed it - the wilds. Everybody loves wild symbols because they help us to complete winning lines. Iron Dog have made them the central feature of this slot, and so we get several of them. We have to navigate our way around the basic symbols to get there, though. On the reels, you'll find playing cards J through to A covering the lowest values, and then an ax, a shield, a helmet, a hammer, and three different sets of runes. The red one is the most valuable of all the basic symbols here. We now move onto the wilds, but as the way that the wilds work in this slot is so unusual and so interlinked with the slot’s bonus features, we think it would make more sense to address them in that section instead. Iron Dog is based down near Brighton in the UK - part of what's considered to be Britain's Silicon Beach. They're a fairly new brand who are just beginning to find their feet in the UK online slots market, having been born as a sister company to the more-established 1x2 Gaming. 1x2 have now grown to the point where they've launched an entire 1x2 Network, which Iron Dog is an integral part of. 1x2 created Iron Dog to be innovators. They're the arm of the network which is intended to create the most original, unusual and technology-driven products. You won't see a traditional slot come from Iron Dog nor anything that doesn't look cutting edge in both presentation and design. Viking Wilds, Treasure of Horus UK slot and Blood Queen slot game are all good examples of what we can expect to see from Iron Dog as they grow, and we look forward to hosting more of their work soon. To understand the bonus features in Viking Wilds, it's important first to understand how the majority of wilds come to appear on the reels. This slot has a feature which it calls tumbling wins. We'd refer to it as a Collapsing Symbols feature; a system whereby every time you find a winning combination, the symbols involved in it disappear, and are replaced by new symbols which fall in from above the reels. Although some of the slot’s wilds can turn up during the base game, it’s far more likely they’ll appear just after a win has happened. In doing so, they can set off a chain reaction of wins. Not only that, they can get you closer to playing the slot’s free spins feature. The first of the wilds is simply a Standard Wild. It appears as a blue disc, and can only appear on reels 2-5. Finding a standard wild also gives you one of the three keys you’ll need to trigger the free spins feature. You can keep track of how many keys you have with a display on the left-hand side of the reels. The Sticky Wild can only appear on the third reel and stays in place even if it's part of a win - although it can fall down a row if the symbols below it collapse. As with the standard wild, it provides you with one of the special free spins keys. Although the sticky wild will survive being part of a win when all the other winning symbols around it collapse, it won't stay on there for more than one spin. The third variety of wild on offer is an Expanding Wild, and it lives up to its name. It can appear anywhere on reels 2-5, and will instantly expand to fill its entire reel. It should, therefore, generate multiple additional wins when it appears. The third and final key needed to start the free spins feature comes from the expanding wild. All three wilds must appear on the same spin or collapsing wins sequence at once to give you the three keys you need to start free spins. To put it another way - it’s not easy to trigger! Adding to the confusion, the reels might expand at random at any time, going from four rows to five. One reel might expand, or all five of them might do so. This is how the slot manages to reach 3125 paylines. If you’ve made it through to the point where you can play the Free Spins feature, the number of spins (and the multiplier awarded) will be dependant on how many expanded reels you have when you trigger the feature. If no reels are expanded, you'll start with 12 free spins and no multiplier. One reel gets you fourteen spins with an x2 multiplier applied. Three reels bumps that up to 16 spins at x3 and all five gets you 18 at x4. Finding more wilds while free spins are active increases the multiplier by a further 1x. As you can tell from the above, Viking Wilds is complicated. Getting to the free spins feature will likely take you luck, time or both, but it’s worth it when you get there. We know this slot won’t be for everybody - and there will be times when you find it hard to follow what’s happening on the reels when collapsing symbols kicks in - but trust the slot to do its thing and you’ll be fine.